After Doug mentioned in the comments of yesterdays post that Marvel was pulling the plug on Atlas, I started thinking what books on my pull-list could do with more of a ground swell than they currently receive. Answer is easy enough - S.H.I.E.L.D. Sure, you can drive a freight train between issues, but when the quality of the book is this good you don't mind the wait. Seriously, artist Dustin Weaver is pulling out the work of his career, if not the best comic art of the year in these pages. 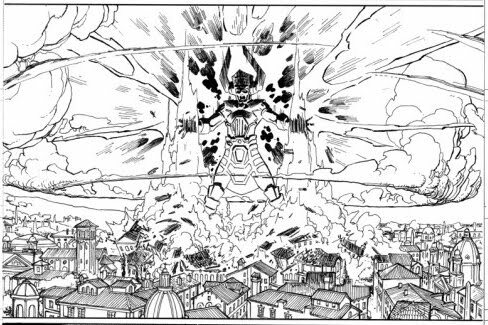 How he renders some of the greatest minds of our time, yet still 'mere humans', going up against Avengers level threats like the Brood and The Celestials is just breath-taking stuff. As writer Jonathan Hickman said in promoting the book "[Dustin] makes murdering trees for print a holy and righteous thing". Speaking of Hickman, if you are reading Jonathon's current landmark run on Fantastic Four then you have a hint of the layers and building subplots this book holds. Add to that the mysteries of The Night Machine and why Leonardo Da Vinici has travelled 400 years into the future, and you have one massive yet intricate plot, that connects the worlds first engineer Imhotep, with Issaac Newton, one of the greatest scientific minds ever to walk the planet. vs. this guy ('Nuff said)! Totally agree with you Dan. The artwork in these SHIELD books is amazing! The story line is a little tricky at the end of the second book, but I am sure this will correct with the third. This is a fantastic series that should be on collectors shelves everywhere! Nice Jonny - glad to hear you are likin' the book too. Thanks for the cool comments! 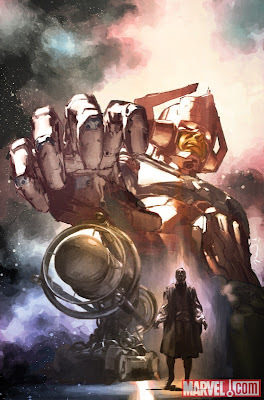 These Galactus renderings on this posting are awesome!